Gorgeous designer home within WALKING distance to 9 wineries! This is the spot! (Sonoma County TOT Certificate # 770N. Online Promo Codes are not valid on 3rd-party rental sites -- please inquire about using a PROMO CODE prior to booking by choosing the option to "ask a question" prior to booking). Hacienda Sonoma is one of the few vacation rental properties within walking distance to so many wineries! Custom built in 2008 -- professionally designed and beautifully decorated, every detail has been thoughtfully considered with wonderful weekends in mind. Entertaining is easy here, and the location is perfect -- walk to nine wineries (or drive to over 50 wineries within 10 miles), walk to a nice dinner or our local market, and no one has to be the 'D.D.' on vacation. If you're a 'foodie,' this house was designed for you! Every possible amenity is available for entertaining in style, including a wood-fired pizza oven. Hacienda Sonoma offers a huge professionally-equipped gourmet kitchen, including beautiful serving pieces, 2 dishwashers, and everything you need to entertain stylishly. We also offer luxurious pillow-top mattresses, travertine bathrooms with lots of elbow space, two fireplaces, a bocce court, a pool table and bar, plasma TV, and whole-house sound system. Our gardens are filled with flowers (plus a lavender field behind the house), a zinfandel vineyard, and herb garden. Gorgeous outdoor living / dining / and cooking areas are lit by chandeliers. A thousand activities close by! Sonoma Valley is full of fun things to do. Whether you're into golf or skydiving, hiking or wine pairings, there's something fun for you in our area. Girls' weekends are great at Hacienda Sonoma! We can arrange for a private chef and/or massage therapists on site. There is also one of the World's top spas (as rated by Conde Nast magazine) just a couple of minutes down the road, with a gorgeous adults-only pool for your use. The best part about our location in Wine Country? No one has to be the "D.D." There's more than a full weekend of wine-tasting within a 5-block radius of our property. If you'd like to sample some of the more than 50 wineries within a 10-mile radius, let us recommend a great limo service to take you wine-tasting in style! A foodie/wine-lover's paradise: Sonoma Valley has been rated as one of the top destinations in the world for food and wine, and Hacienda Sonoma was designed to be the perfect environment for enjoying them. Our kitchen is huge and extremely well equipped. When have you rented a vacation home that came with an Italian wood-fired pizza oven, a KitchenAid stand mixer, an emulsion blender, two dishwashers, two coffee pots, built-in grill, electric wine bottle opener, and matching place settings for 20? We love to cook and entertain, and we love to do it in style. Visit the local farmers' markets and be inspired, or, hire our chef to come and cook for a truly memorable occasion. Fun is everywhere at Hacienda Sonoma! Our bocce court, pool table, whole-house sound system, plasma T.V., upstairs bar, Blu-Ray DVD player, DVR, DirecTV Satellite system, VCR, puzzles, board games, WiFi, and even the redwood play structure in the back yard, means that fun is had by everyone in the group. Sonoma County TOT Certificate # 770N Please inquire about PROMO CODES prior to booking. Also, HomeAway cannot differentiate between minimum stays on weeknights vs. weekends vs. holidays. If you are staying during the week, we can offer shorter minimum stays. Please choose the "ask owner question" option prior to booking. I'm a grapegrower, winemaker, mom of two kids, and executive recruiter. My husband, Rick, and I are wine lovers and enjoy 'getting away from it all' but not so much that we have to get in the car and drive a long way to do something fun. We can walk to many of the wineries in our area, some great restaurants, a neighborhood market, and some cute shops. We can walk down the street to live music, food pairings, or barrel tastings on most weekends, and are surrounded by the friendliest people. We love Sonoma Valley! We looked for 5 years for the perfect spot to build a custom home. At first, we looked at mountaintop properties with expansive views, but we quickly realized the drive up a winding narrow road would defeat the purpose of buying in Wine Country. We wanted to be near everything fun, enjoy a short stroll to dinner or lunch, or even walk to a wine and food pairing. And yet, we didn't want the traffic and noise of being downtown, and we wanted the gorgeous views of rolling vineyards. Kenwood is our perfect spot! Our friends can visit and no one has to be the 'D.D.' There is a World-Class spa about two minutes down the street, great restaurants, fabulous wineries, golf, and a small-town feel to our area. We are one of the few vacation rental properties so close to the many gorgeous vineyards in our area. You can walk just 2-4 blocks for wine tasting at 9 wineries. One of them offers a 7-course gourmet food pairing for just $30! It's food and wine heaven in our neighborhood. The house is custom-built with lots of amenities like a bocce court, pool table, zinfandel vineyard, giant gourmet kitchen, lavender field, two fireplaces, soaking tubs, and more. We gave a lot of thought to every little detail, and the house was designed with entertaining in mind. toilet, combination tub/shower, Separate make-up area, and enclosed toilet room. toilet, tub, shower, Fireplace near tub. 2 sinks and separate makeup vanity. All bathrooms are luxuriously tiled in travertine and outfitted with beautiful and modern fixtures. One of the bathrooms includes a fireplace. We are surrounded by wineries, vineyards, and rolling grapevine-covered hills. Gorgeous area! Forced air as well as heated floors. Large 36" Gas Range with giant oven. Coffee, tea, sugar, flour, olive oil, vinegar, many spices, condiments, etc. Plus an herb garden! Beautiful serving pieces of every kind for your gourmet meals. Huge gourmet kitchen including two dishwashers. There is enough room for many of cooks in this kitchen! Ask about having our chef visit! We have two spacious dining areas - one inside, and one outside. Regulation-sized pool table, board games, cards, poker chips, etc. 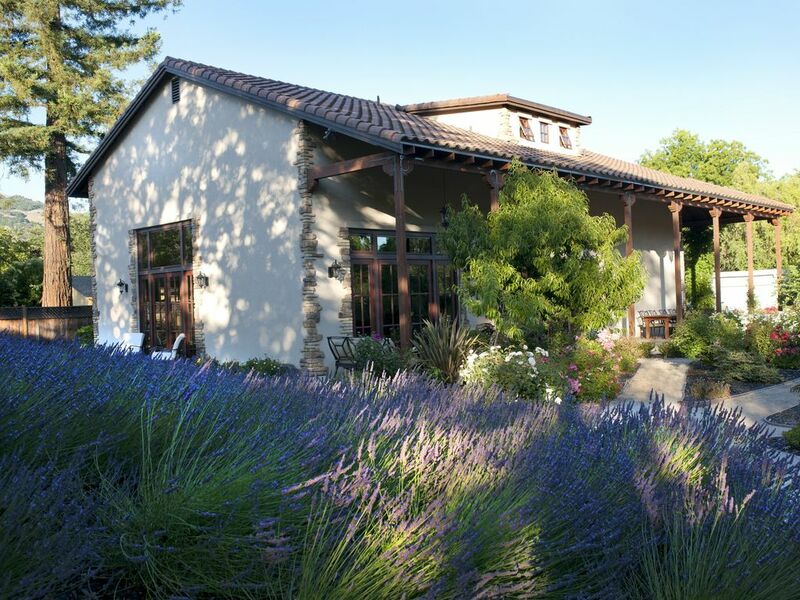 Gorgeous gardens with lots of flowers, a lavender field, and a Zinfandel vineyard. There is an herb garden, peach, fig, and mandarin orange trees, & tomatoes (when in season) available for your use. Covered patio is lit by chandeliers and offers lots of comfy furniture, including a sofa. We have a crab-trap with instructions for crabbing at Bodega Bay when in season. Our range is a 5-burner professional range with huge oven. We have two dishwashers and every kitchen amenity you can think of, including a wood-fired pizza oven. We also have an Italian-style bocce court behind the house next to our lavender field. Upstairs, a regulation-sized pool table, and a huge hand-carved 10-foot-long bar is perfect for fun in the evening. We offer two fireplaces, and one of them is a double-sided fireplace -- one side faces the bed, and one side faces our large 2-person soaking tub in the bathroom. We had a great time in wine country. The house was fabulous. We (3 couples) thoroughly enjoyed our stay in Kenwood. We spent an entire day at the house enjoying the outside grill and wonderful property. The location is excellent, with restaurants, market, and wineries a short walk away. We had the most wonderful time in Sonoma and the house was absolutely perfect! It had everything you would ever need. From the chef to the comfy beds it was wonderful! Wonderful stay in this spotless and luxurious house. Beautiful garden, great interior spaces, including upstairs entertainment area with pool table. Owner was a pleasure to work with. Plenty of space for two or three couples with a professionally designed garden. Plenty of kitchen wares for entertaining. Owner makes an effort to make sure you are comfortable and have information to do things in and around Sonoma. We found several great wineries and restaurants within walking distance. Walked in the hills nearby and bike riding in and around Sonoma. The owners have thought of everything to make our stay wonderful. Would highly recommend starting here if you have the chance. This is a beautifully landscaped home, perfectly located an easy stroll from several nice wineries. Packed with games for young and old (we enjoyed games of pool every night and bocce ball before dinner), the house is fully equipped for lavish entertaining, but is equally comfortable for the chill family hang-out. My only caveat is that the kids' room upstairs, although charmingly decorated with a camp theme, has no windows. I would not want to have little ones staying there. Since we didn't need that room, however, we simply closed the door. Hacienda Sonoma is within WALKING distance to many of Sonoma Valley's finest wineries, AND WE HAVE BEEN UNAFFECTED BY THE NORTH BAY FIRES. We are just a block and a half from Hwy. 12, (the main winery route through Sonoma Valley) in a sophisticated country setting, but close to everything Wine Country has to offer. Golf: There is lots of golf in our area! Weeknight stays only require a 2-night minimum, but a weekend stay MAY REQUIRE 3 OR MORE NIGHTS depending on the time of year or holiday weekends. (Sonoma County Transient Occupancy ID #770N). Unfortunately, HomeAway is not able to differentiate minimum stays. If you have a shorter stay, please choose the "ask a question" option prior to booking.